My name is Albert Koenig, and I am a 21-year-old cowboy from Belgrade, Montana. I currently attend school at Montana State University in Bozeman, where I am double-majoring in Agricultural Business and Economics with minors in Finance and Spanish Language and Culture. I have been rodeoing for about 10 years now and grew up growing hay and raising cattle with my family in the Gallatin Valley. I love roping, the sport of rodeo, and the entire Western lifestyle that I have gotten to know over the years. My primary rodeo events are Tie-Down Roping and Team Roping, for which I ride my AQHA partners named Wimpy and Nitro. When I am not in school or headed to a rodeo, I like to work to support my passions. I have built up my own small herd of corriente and beef cattle over the years, as well as haul hay, cattle, or gravel with a semi truck. During the school year, I work as a tutor for the Montana State University Athletics department and help local farmers and ranchers haul grain, move cattle, or whatever else needs to be done. I pride myself in being a hard worker, a good student, and giving my all in everything I commit myself to. I also enjoy reading, working out at home or in the gym, and listening to podcasts (Tyson Durfey is one of my favorites). I thank my Lord and Savior, Jesus Christ, for all the blessings that I have been given, as well as my parents, Shawn and Michelle, and countless others for the opportunities that I have been blessed with in my life. If it weren't for the incredible people who love and support me, I would never be able to enjoy the successes and experiences that I have had, and for that I am forever grateful. Montana PRCA ProRodeo Circuit Finals Qualifier: I am very proud that I was able to make the PRCA Circuit Finals in my first year ProRodeoing after buying my permit in mid-June of 2018. What made this accomplishment even more special is that the horse I rode all year was one that I bought myself and worked hard to finish and season the summer between my high school graduation and first semester of college. Northern Rodeo Association Finals Qualifier: The Northern Rodeo Association is where I first started competing at an open level when I was in high school, and even though I have qualified for NRA Finals 5 times now, it is still a special event to be a part of. With many of the top competitors in the Montana, Mountain States, and Badlands Circuits in the PRCA also being entering NRA rodeos, it is satisfying to be in the top 10 year in and year out in the NRA. Fallon County Fair & PRCA Rodeo (Baker, MT ) Champion: This rodeo is one of my biggest wins to date and holds a special place in my heart. Baker, Montana is an incredible Pro Rodeo that draws some of the best contestants in the world to compete with their $15,000 added featured events that rotate every year. I am very proud to have won this rodeo, beating out many World Champion cowboys and several of my ProRodeo heroes, such as Blair Burk, Caleb Smidt, Clint Cooper, Monty Lewis, Scott Kormos, Trevor Brazile, and many more. This was a very humbling win for me and gave a whole new meaning to the phrase "work until your idols become your rivals." Fort Benton Summer Celebration PRCA Rodeo Champion: Winning the Pro Rodeo in Fort Benton, Montana was a proud moment for me for a few reasons. First, it was only my second PRCA rodeo that I competed in, so I am proud of the fact that I had the mental toughness to step up to a higher level of competition and be able to be successful and prove that I belonged alongside the best in the business so quickly. This win was special as well because I had to face some adversity getting to the rodeo and right before my run. I rolled into the rodeo as the National Anthem was playing because I had to turn around and rescue a fellow calf roper who was up that night after his pickup overheated. We made it just in time for the calf roping, which was good since I was 2nd out that night. Then, on the first run, the barrier broke and I was stuck waiting out in the arena while they fixed it, only having had one run to watch where the barrier didn't even work. I relied on my experience and believed in my ability to score sharp and go make the best run possible on the calf I had drawn, and it all worked out to be a defining moment in my career. Ravalli County Fair NRA Rodeo Champion: In 2017, this Labor Day weekend rodeo was the biggest NRA rodeo of the year with the most added money and contestants. It was also the last weekend to solidify myself in the top 10 in the NRA and make the finals. I was on the bubble at the time, in about 9th place, as I had not been able to rodeo as much due to horse injuries. I was up almost last out in the last performance in front of a packed house, and after watching a couple of the best calf ropers in Montana tie their calves good, I knew I had to push myself, make no mistakes, and execute in order to place and make the finals. I was proud that I was able to take the pressure and run with it and win the rodeo with a 9 seconod run on a tough set of calves. Montana State University Northern Rodeo Champion: I was proud to win the MSU-Northern college rodeo team roping title with my sister, Ashley, as I have worked really hard since high school to convince her that she can be as competitive as anyone, male or female, in the team roping. We didn't have a very good steer drawn in the short round, as he was known to run left hard and get to the fence before you could heel him. I was proud of the way that my sister didn't panic, just made sure to get him roped, and that I was patient and took a shot where I knew I could rope him by two feet. Our run went a little long, but the smart roping payed off when no other heelers caught one smooth in the short go and we took home some hardware together. Montana Bowl X Champion: This jackpot win was meaningful to me because I was proud of the way I was able to keep my focus through 1000+ teams, rope consistently, and make the most of the few runs that I had, all while riding a greener horse that I had only roped on for a couple of months. National High School Rodeo Finals Qualifier: It has been 2 and a half years since I was in high school, but I am still proud of the three times that I made it to the NHSFR in the calf roping and the team roping, especially since I qualified heeling for my sister our senior year. National Intercollegiate Rodeo Association Scholar American Award: Both years that I have competed in College Rodeo I have won a NIRA Scholar American Award, which is given to contestants who earn a certain amount of points in their rodeo events at the region level, as well as maintain above a 3.5 cumulative GPA in school. Montana State University President's List and Dean's List: Throughout every semester so far in college, I have been able to balance my academics, work, and rodeo schedule well enough to land on either the President's List (4.0 GPA) or the Dean's List (3.5+ GPA). 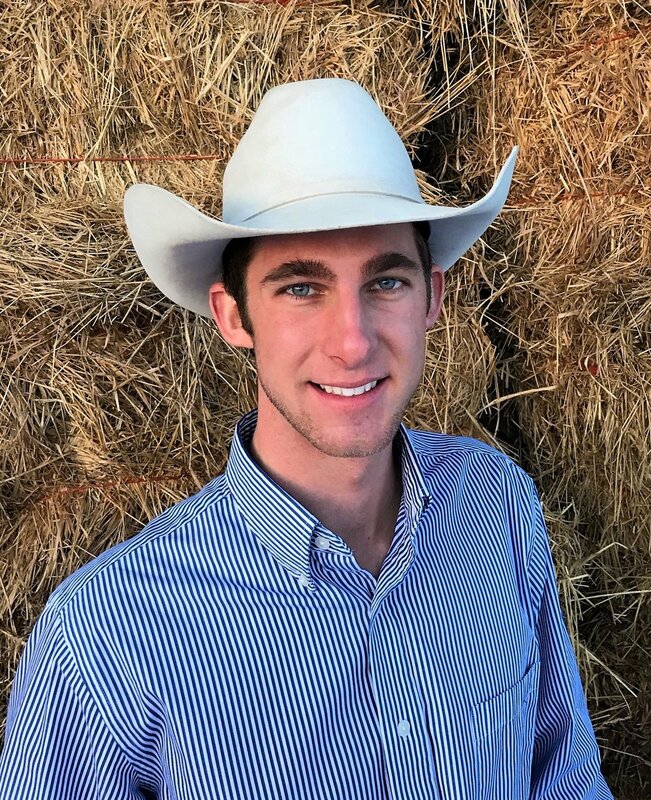 Montana FFA State President: Being a rancher myself and coming from a farming and ranching family, agriculture has played an important role in my life for many years. Therefore, I was extremely proud to have been selected by a committee of business leaders, educators, and my peers to lead the 5,000+ members of the Montana FFA Association and be a positive force for the agricultural industry. Rodeo Bible Camp Instructor: For the past several years, I have been hired to instruct rodeo clinics and serve as a youth counselor at a Fellowship of Christian Cowboys Rodeo Bible Camp near my hometown for ropers age 7-15. Teaching these young people about the sport of rodeo and the teachings of God is so rewarding that I am happy to donate my paycheck back to the camp year after year. I am proud to be able to make a positive difference in the lives of these youth and be an enabler and encourager for the next generation of rodeo contestants. It's always very humbling to see my students sorting cattle or behind the chutes at their hometown rodeo, hear about their struggles and successes, and see the look on their face when I give them a rope or a string to keep working on their game with.